U.S. athletes walk in a parade during the Opening Ceremony wearing Ralph Lauren. Who said sportswear can't be chic? The athletes' parade during Friday's opening ceremony might as well have been a catwalk show, with some of fashion's biggest names — Armani, Prada, Ralph Lauren, Stella McCartney — designing the team uniforms. 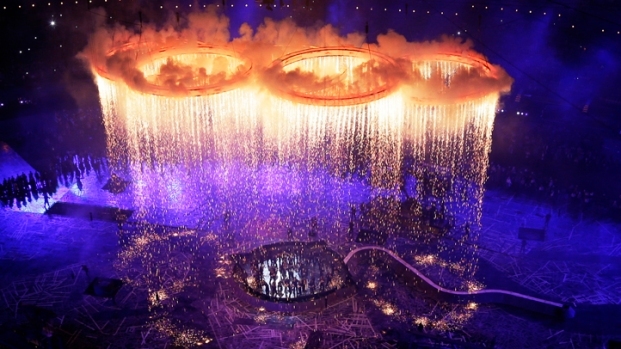 Many in the fashion industry are already calling this the most stylish Olympics ever. "For any designer, this is the biggest audience you can possibly have for your designs and arguably the most critical," said Avril Graham, Harper's Bazaar executive fashion and beauty editor. "These outfits have to fly the flag and represent their nation in the eyes of the rest of the world." The Italians must be some of the best-dressed athletes, scoring points with an understated monochrome kit in navy and white by Giorgio Armani, as well as waterproof blue designs for their sailing team by Prada. Stella McCartney has worked with Adidas to design the sporting gear and "village wear" (read lounge wear) for Britain's home team, though the outfits weren't on show Friday as athletes covered up in white and gold tracksuits. McCartney's gear takes inspiration from the iconic Union flag, but she said she deconstructed it to make it "more delicate and feminine." Look out for them on the track and at the pool: Red is sparingly used to highlight a palette that mostly features white and shades of blue — turquoise, navy, cobalt. Meanwhile, the American team may have gotten a barrage of bad press for its made-in-China Ralph Lauren uniforms, but the preppy designs were still some of the most stylish in the arena: clean-cut navy blazers, crisp white trousers, skirts, and shoes, accessorized with navy berets and blue, red and white striped scarves. The Jamaican team is in the spotlight because of sprinter Usain Bolt, so it's fitting that it also got a boost in the fashion stakes this year. Its kit, which features the national colors as well as lightning-like prints, was designed by Cedella Marley, daughter of legendary singer Bob Marley, for Puma. The styles were modeled by a flamboyantly dancing Bolt at a London catwalk recently. "Cedella Marley brings island color to team Jamaica — a sea of tropical yellow, green and black," Graham said Friday. Other designers behind the Olympics this year include luxury label Hermes, which designed riding jackets for the French equestrian team, and Salvatore Ferragamo, which designed the official uniform for the tiny European republic of San Marino. Some designers didn't get involved in the official Olympics gear but used the games as an opportunity to cash in and promote their brands anyway. Karl Lagerfeld, for example, launched an Olympic-themed women's wear collection called Team Karl at the London department store Selfridge's — though he reportedly said he wouldn't tune in to watch the games. Meanwhile, high-street chain store H&M said it was launching two pop-up stores dedicated to selling sportswear in London. Friday's parade of athletes also showcased some surprising and less popular designs. The German team was notable for not using its national colors at all. Instead, the kit was all hot pink for the women's jackets and cornflower blue for the men. Both were paired with white trousers. The Czechs, meanwhile, wore bright blue wellington rain boots paired with white shorts. Spectators also made their own judgments about the much-maligned uniforms for the Spaniards and Russians, both made by Russian sportswear company Bosco. Some Spanish athletes have posted tweets grumbling about their garish red and gold outfits, and there are even Spanish Facebook groups set up to campaign against the gear. Official kit aside, there were strong fashion showings in the spectator stand, too. Michelle Obama chose a white dress by J. Mendel, while the Duchess of Cambridge, formerly known as Kate Middleton, dazzled with a pastel blue satin and belted coat dress reportedly by wunderkind Christopher Kane. British Prime Minister David Cameron's wife, Samantha, demonstrated her fashion credentials with a bold red and black outfit by London-based designer Roksanda Illincic.